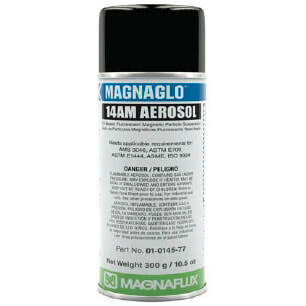 This high-performance prepared particle bath combines Magnaflux’s best-in-industry 14A magnetic particles with Carrier II NDT-approved suspension oil for quick, reliable mag particle testing with less maintenance. 14AM is an ideal choice for high performance inspections of precision safety-critical or high-stress components, and to extend the life of valuable mag particle equipment. 14AM meets all major industry and NDT specification requirements, including Aerospace, ASTM and ISO 9934.